There is an extremely wide range of dataloggers available to measure temperature & humidity depending on the installation environment, accuracies and range required. Here are three new products from ONSET COMPUTER CORPORATION for whom we offer full sales and support in New Zealand. Indoor temperature regulation and optimisation for residential, educational, industrial, and commercial premises using wireless sensor networks take a major part in enhancing systems for building automation, healthcare, temperature control, energy consumption monitoring, moisture monitoring and so forth. 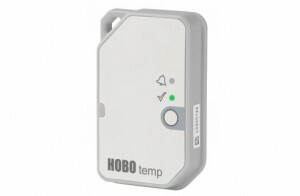 Onset's HOBO MX100 Bluetooth Temperature Logger for indoor environments is a low-cost, splash-proof data logger that measures and transmits temperature data (range from -30oC to 70oC) wirelessly to mobile devices via Bluetooth Low Energy (BLE) technology. 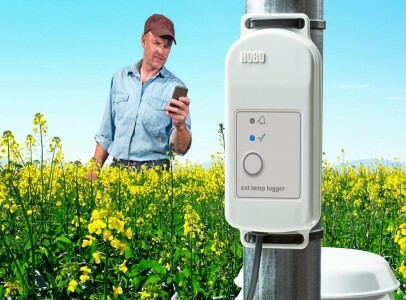 The device communicates via bluetooth to an iOS device running the HOBOmobile app. (free download from the Apple Store). The device communicates via bluetooth to an iOS device running the HOBOmobile app. (free download from the Apple Store). 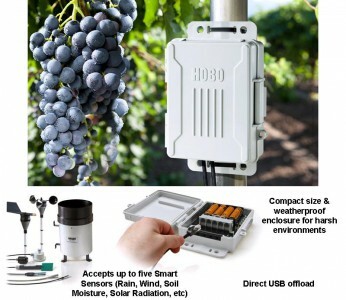 HOBO USB Micro Station is a weatherproof data logger for multi-channel monitoring of microclimates. This battery-powered station accepts up to five plug-and-play Smart Sensors and has a hinged door to make sensor installation simple and quick. The Micro Station is equipped with a built-in USB port for fast, efficient data readout to a computer, and integrated mounting tabs for easy installation.